Interchangeable Core: A cylinder designed to be removed and replaced without tools using a special key called a control key. Many companies offer interchangeable core (IC) cylinder systems. Most common is the Best-compatible interchangeable core system, otherwise known as small format IC, or SFIC. 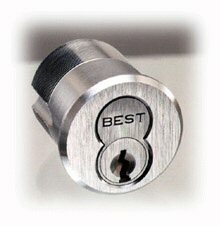 These are called ‘Best-compatible’ because they are basically copies of the IC system first developed and marketed widely by the Best Lock Company. Best-compatible interchangeable cores are available from Best, Arrow, Falcon, KSP, Ilco, Medeco, Schlage and many other companies. These cores are typically available in all of the Best common lettered keyways, A through Q, and/or in a few proprietary or restricted keyways that may be offered by each company. Below is a picture of a small format interchangeable core. Only slightly less common are systems that are not Best-compatible such as Schlage, Corbin, Medeco, Yale, Sargent and ASSA. 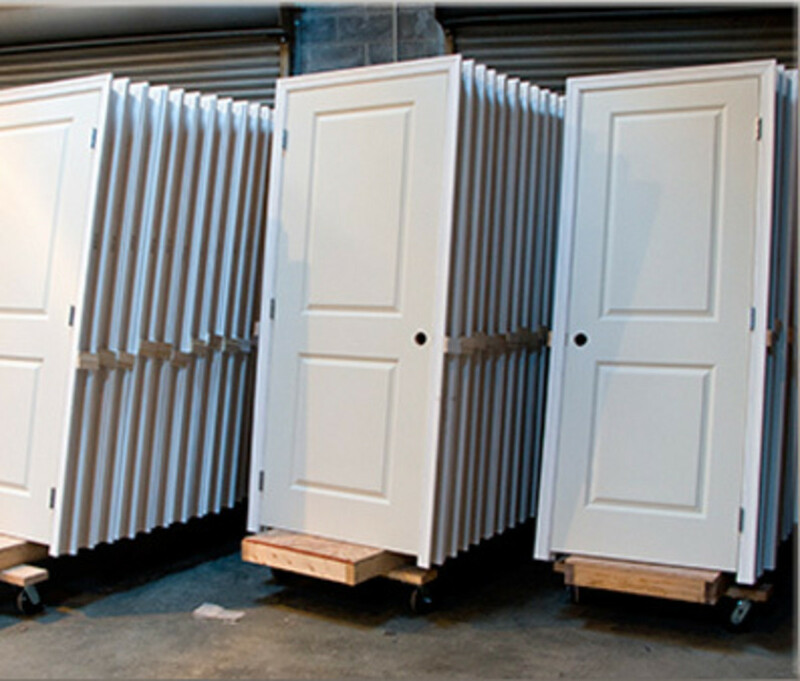 These are referred to in the industry as large format interchangeable core systems (LFIC). When first encountered LFIC may be difficult to distinguish from SFIC since the hole that receives the core is basically the same figure eight shape. Below are pictures of popular large format interchangeable cores. Note that although the small format interchangeable core above looks larger, it is actually smaller than the cores pictured below. If you look closely at the cores above you will notice that the Schlage large format core is different than the others because the top cylindrical part is smaller than the bottom cylindrical part. This makes Schlage large format IC much easier to distinguish than others. An IC system is comprised of two major components: the core and the thing that accepts it. 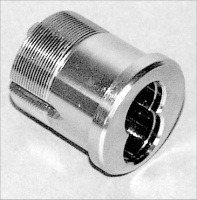 The accepting part could be a cylinder housing – so called because unlike a standard cylinder it has no pins or inherent way of accepting a key, but instead has a hole to accommodate insertion of an interchangeable core (see pictures at right). Housings such as the one pictured above are used with mortise locks, rim locks and many exit devices, both for exterior entry and for cylinder dogging. 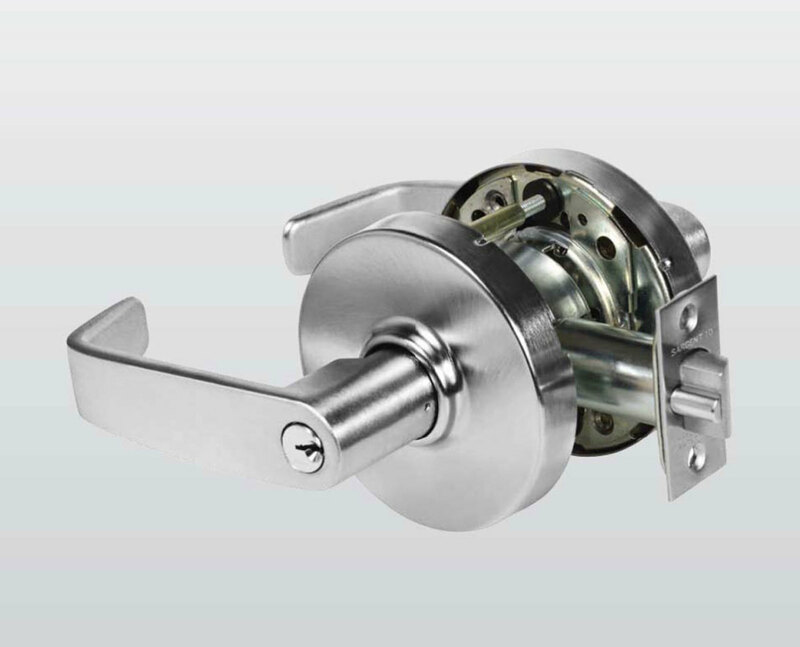 Cylindrical locks do not take housings but are manufactured with a hole for an interchangeable core instead of a cylinder. Such locks are said to be “prepared for interchangeable core.” Pictured at right is a cylindrical lock prepped for interchangeable core. Typically interchangeable cores are used in large master key systems. 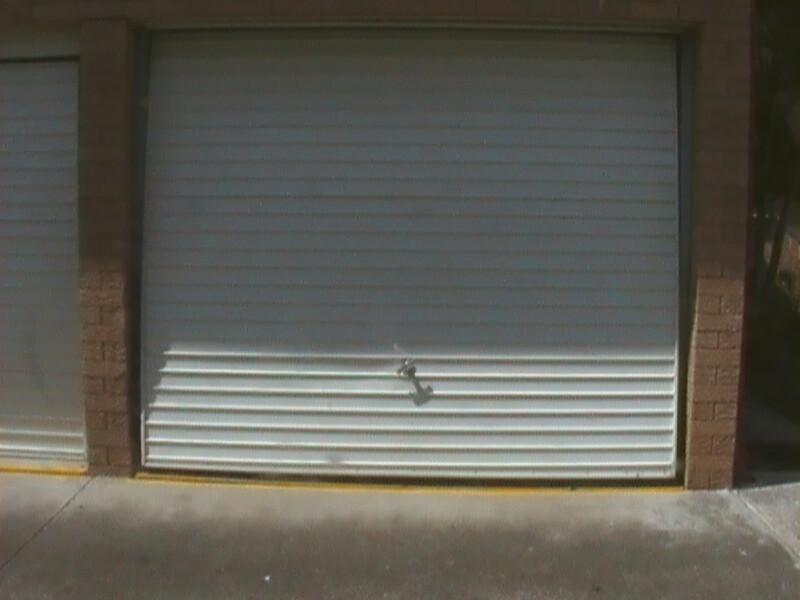 The chief advantage of an interchangeable core key system is that only the initial installation need be done by security hardware installation professionals. Subsequent key changes can be performed by anyone who can competently use a key. Most manufacturers have a construction core program. This allows the project manager to purchase temporary cores for use by workers during the construction phase that can then be easily removed and replaced with permanent cores. Construction cores are said to be “construction keyed” (usually keyed alike), and use what are called “construction keys.” IC construction keys are not materially different than regular IC pass keys. The construction cores can be easily replaced by a security officer or facilities manager. Interchangeable cores are usually keyed to three basic keys: passkey, control key and master key. 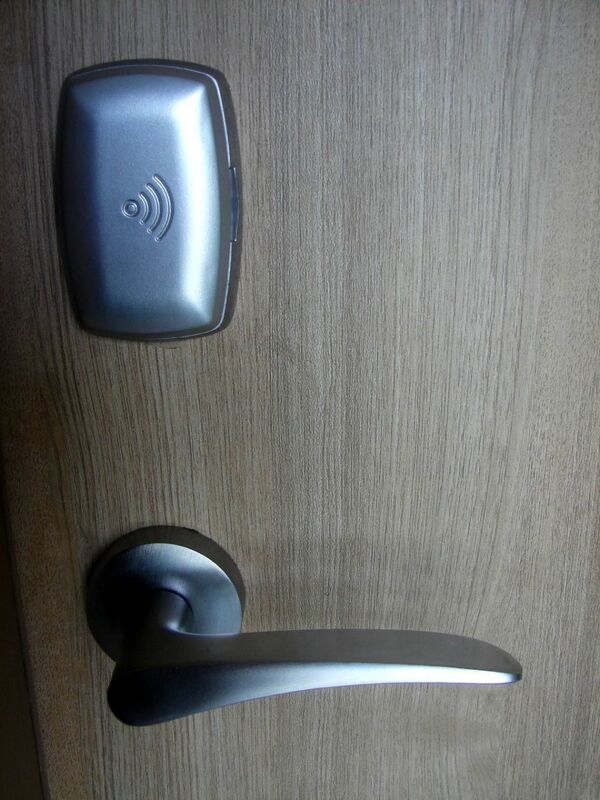 The pass key is the one handed out to tenants so that they can access their space; the control key is the key that is used to remove and replace the core; and the master key may open all locks or a group of locks within a given system. Best format SFIC keys differ from all other keys in that the “shoulder” of the key is located at the tip of the key instead of near the bow (head) of the key. Other interchangeable core formats place the shoulder of the key in the usual place near the bow. SFIC keys place the shoulder at the tip because the cores are too small of a diameter to accommodate a standard key. That is why one usually only encounters them in the Best lettered keyways, A through Q. Large format cores are usually offered in all of the corresponding manufacturer’s standard keyways. For example, if you want an interchangeable core system in a Yale GA keyway, you need a Yale large format interchangeable core system. Interchangeable core systems offer property managers or security officers the ability to quickly and easily change the locks within the system. All they need to do is keep a sufficient quantity of cores with keys on hand. Manufacturers offer different options as regards key control and security. I recommend in-depth study of several before deciding on which manufacturer’s interchangeable core system is best for your situation.